It's time to learn your craft and change the way you approach chess endgames. Here are some endgame nuggets to help you succeed in Material Face Offs. Make yourself at home with disciplines like opposition, zugzwang, triangulation and outflanking. These themes are the bread and butter of endgame strategy. Other important ideas include play on the seventh rank, creating two weaknesses and the value of adopting a cat and mouse strategy. Discover the value of a passed pawn and how to exploit it. Finally I can't stress enough the necessity of analyzing your chess games. But first let's talk about the fighting King in the closing stages of a game. 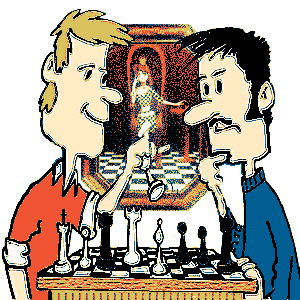 Chess Endgames: Both Kings will try to push the other back. The central control of squares by pawns will have a bearing. When you first learn to play chess they tell you to get the King safe. It's one of the mantras of the opening. Develop your pieces, get them to active squares, ready to attack. Every piece except the King. The King must be tucked away in the corner behind as much cover as possible. Wrapped up in cotton wool. Makes him seem weak and frail doesn't it? Well the King is not so weak and frail. He is actually stronger than a minor piece. A lone Rook is also well advised to keep a respectful distance. No the King is simply more valuable that's all. All good players watch out for that point in the blurry lines between the middlegame and the endgame. The moment when the King must stride towards the center and become the central player in the fight. The principle of opposition is a critical, fundamental aspect of chess strategy in the endgame. You must learn and understand it's intricacies. It's absolutely crucial to gain opposition in the battle for victory. It is most important in King and pawn endgames but also features in other endgames. Opposition is when two Kings stand on the same rank or file and on squares of the same color. If there are five squares between the Kings we call this distant opposition. If there are three it's referred to as opposition. When there is just one square between the two Kings we say they are in direct opposition. There are a few things to be aware of when dealing with this concept so lets take a look at the ins and outs of opposition. Positions with zugzwang occur frequently in chess endgames. Zugzwang is taken from German and means compulsion to move. It describes any instance where a player cannot make any move without significantly weakening his position. Zugzwang usually results in a winning position changing to a draw or a draw changing to a loss or where a won game ends in defeat. Zugzwang is in a subtle sense a recurring aim of chess strategy. You always want to force your opponent to choose between a bad scenario and an even worse one. But it is the instances where you play a move that literally puts your opponent in a straitjacket that we refer to as zugzwang. Triangulation is the art of losing a tempo or losing a move. Sometimes in a position it would be far more advantageous to pass the move to your opponent. So you fix it so the other guy has to move from the same position. You move your King three times in the shape of a triangle and return to the same position. Meanwhile your opponent has been forced to move and return in two moves. The result is the board returns to the previous position only now your opponent must move. It is in such a situation that triangulation is most useful. Triangulation is used to put the other player in zugzwang. Sometimes when you have opposition you give it up momentarily to eat into your opponent's territory. In the diagram, White to move will not maintain opposition with Kc3. He has to make progress. So he temporarily gives up opposition in order to make his way up the board. He does this with Ke4. Black will not keep opposition on the next move because he needs to keep his King in front of the White pawn. The move ...Kc4 would be a disastrous reply. He will retreat instead and White will regain opposition. Outflanking is an integral feature of chess endgames. This technique is used repeatedly along with opposition, zugzwang and triangulation during the struggle to gain dominance in the final stages. One of the most important themes in chess strategy is winning control of the seventh rank. If you can establish your Rooks there you will be able to clean out the opposition base. A Rook on the seventh rank is very often called a pig. He can start gobbling up helpless pawns and undermine the entire enemy position. Such a Rook is like a pig guzzling swill from a trough. The conquest of the seventh rank is always a central plank in the plans of top chess players. There are numerous ways to play for this. Benko - Averbakh, 1958: Benko is playing Cat and Mouse against Averbakh. He will grind out a win through small, incremental improvements and by torturing Averbakh with a hopeless position. As you improve you will often find yourself entering the endgame in a winning position. So how do you approach this happy scenario? We are told that when we have the initiative we are obliged to attack, lest we lose the edge. But this advice is more relevant in the middlegame when the advantage is often dynamic in nature and therefore temporary. In the endgame you will likely have converted your advantage to a positional or material boon. In the endgame there is no rush. In the opening we are trying to do as much as possible with each move. But now as the game reaches the conclusion we can take our time. What can be done in two moves is sometimes better done in ten. Alekhine - Samisch, 1925: By capturing the Black pawn on h7, White has just given Black a second weakness. He must now defend against the passed b-pawn and the newly created passed h-pawn. I sometimes had frustrating games where I felt like I had gained a definite advantage but failed to win from it. I would win an exchange or a couple of pawns. Or sometimes I would destroy my opponent's pawn structure and keep my own healthy. And yet even with a material or positional advantage for no compensation I would not be able to break my opponent down. I would go for him but he would get all his forces to the weak point and I would not be able to break through. I would usually end up losing on the clock and I would be angry. Imagine the light bulb moment when I discovered this great concept of creating a second weakness. It's so logical it almost seems obvious. Another evolution in my development. The passed pawn is one of the most fearsome weapons you can hope to have in a chess endgame. Obviously it's a potential Queen or as some people like to call it a baby Queen. Even if it never promotes it causes havoc in the enemy camp. Your opponent is practically forced to blockade it with a piece for a start. This piece loses much of it's mobility and is sometimes frozen out of the game. A distinction has to be made between a blockade in the enemy half of the board and a blockade in your own half. Apart from being basically a piece down, the blockading piece and the passed pawn often form a wedge in the heart of the enemy camp. Vital ranks and files that ought to serve as highways for mobile pieces are blocked up. This greatly limits the activity of the opposing forces. Endgame analysis and chess analysis in general are fundamentally important in your development as a chess player. When I first began to play my games were taking on the same basic patterns. I was making the same unsound moves based on the same unsound assumptions game after game. The games I won were only won because my opponent would be at the same level as me and did not know how to take advantage. When I did lose it was against people who did know. In retrospect I did not even know which of my moves (apart from the obvious blunders) were the bad ones. It was only when I began to analyze each game that the engine was highlighting them. I still didn't always immediately know why they were bad but the database and endgame tablebase were able to show me better moves. And now we bring the curtain down on our endgame discussion. Key positions are very important and the principles and ideas involved in learning to play them well will help you play all positions well. The ability to outmaneuver your opponents no matter what material is left on the board in the endgame is another important skill. Learning how to handle each piece in each scenario is the secret behind these incremental improvements over time. Mastering these endgame themes mentioned here provides you with all the skills and know how you need to navigate your way through the most difficult of endgames. There's nothing better than winning a long hard game directly because of a skill learned on the training field. But you have more progress to make. Develop your skills in the middlegame.